← In a Vase on Monday. Celebrating Autumn Colour. In a Vase on Monday. Tyrian Purple. 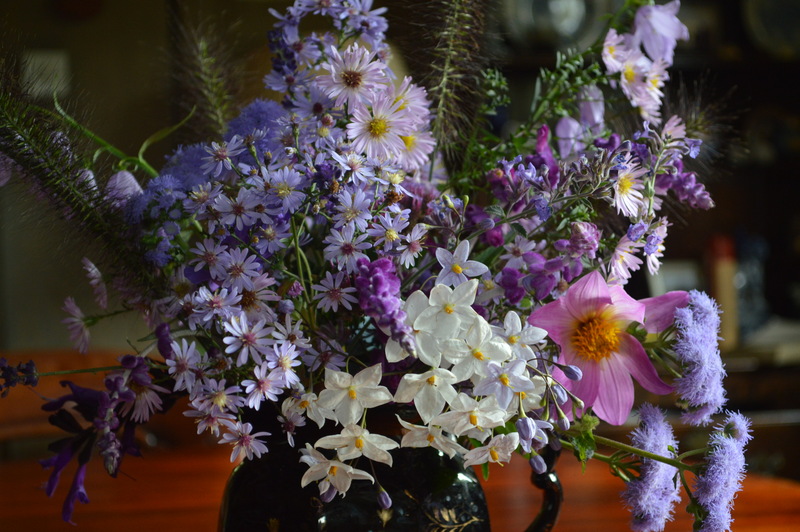 Last week I celebrated autumn in my arrangement, but today is October and I feel I need to recapture the memories of summer with some lush shades of purple, mauve and violet. Tyrian purple was a costly imperial colour made from thousands of tiny snails. No snails were involved in my arrangement. Asters are reigning in the garden at the moment and I love the small starry ones which are true to their name. I used my favourites; ‘Le Vasterival’, ‘Little Carlow’, Aster cordifolius ‘Ideal’ and Aster cordifolius ‘Photograph’. These are all actually now symphyotrichums but today I am sticking with the name asters. There are a couple of salvias; Salvia leucantha ‘Purple Velvet’ and Salvia ‘Amistad’ which is a true purple and looks as if it could be made from crushed snails, unlike the rest of my blooms today. I also used the lovely white and lilac coloured Solanum laxum ‘Crèche ar Pape’ which I thought must be a misprint when first I saw its name because it doesn’t make sense, but ‘Crèche ar Pape‘ is actually the name of a garden in Brittany. I notice a lot of people are listing it as ‘Crèche du Pape’ now which sounds grammatically correct, but bizarre. Being celibate, I don’t suppose the pope has much need of a crib. Other flowers are a dahlia seedling, which is cheating because it’s pink, a few late sprigs of lavender, Verbena bonariensis and Geranium ‘Rosanne’ which blooms all summer long. I have featured the fluffy heads of Ageratum ‘Blue Horizon’ before and I will certainly grow it next year as it blooms for ages and is a wonderful cut flower. Ok, I know these are blue but they go quite well with the purple and lilac. I also used fluffy heads of Pennisetum alopecuroides ‘Hameln’ which is a fabulous grass which has obligingly seeded itself about. 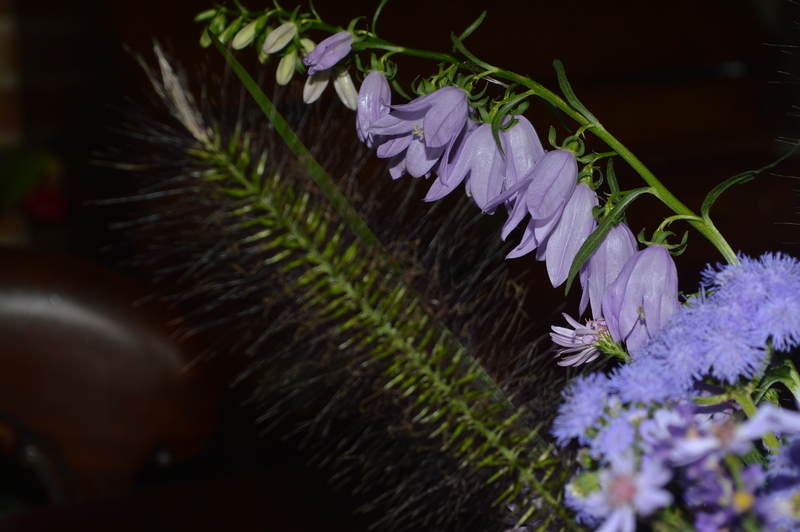 The campanula is the invasive Campanula rapunculoides which is a pest and I am always trying to eliminate it. Its common name is ‘Creeping Campanula’ and that is a good name for it. As it really is autumn now I used a purple fruit as a prop. It is a fruit of the Akebia quinata and this is the first time I have seen fruit on my plant. There are plenty of seeds which I shall be sowing. Passiflora ‘Silly Cow’ with its huge exotic blooms is just the thing to finish off the arrangement and rescue it from being too airy fairy. 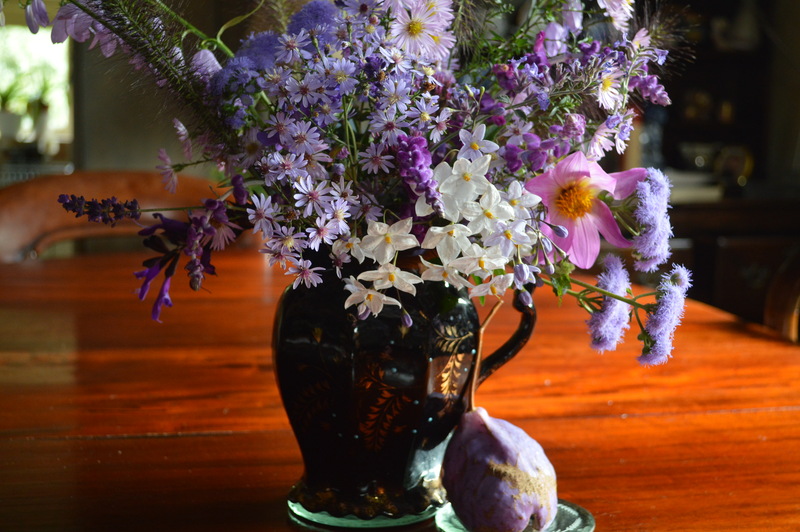 I arranged the flowers, (well plonked them actually,) in my black Victorian mourning vase which is appropriate as today I am in mourning for summer. Cathy who hosts this meme, ‘In a Vase on Monday’ has featured some of her lovely collection of knotweeds today, which are are actually not weeds at all. They are called persicaria these days and very pretty they are too. Do go and see. 49 Responses to In a Vase on Monday. Tyrian Purple. Tyrian Purple or not, this arrangement is fit for royalty! I love the beautiful colors you’ve used and the akebia fruit is a perfect prop, reflecting the colors of the arrangement and representing the fullness of autumn. I join you in mourning for summer. Thank you Peter and where has the summer gone? In the words of the bard: ‘Summer’s lease hath all too short a date’. Couldn’t have put it better myself. Thank you Lavinia, the bonus at this time of the year is the range of puplish shades, specially with so many asters about. I remember all the wild purple and white asters from back east. None here. I miss them. What a full and interesting vase, Chloris, desribed in your usual inimitable style – I have made a note of some the contents, especially the ageratum whuch I have nevered considered growing before. 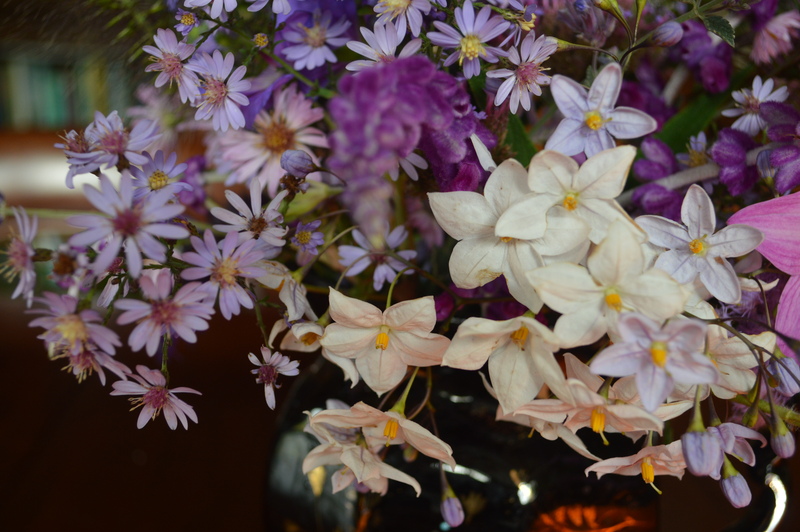 Love all the ‘purples’ – and that akebia fruit. Dare I ask if it is edible? Thank you Cathy. This ageratum has long stems and so is perfect for picking, it is very long lasting in a vase. I just looked it up and the akebia fruit is edible, it is grown as a food crop in Japan. It doesn’t look very tempting though. Maybe I will try a nibble. I wouldn’t have thought that ageratum would have long stems, which is why I was surprised to see it in your vases – definitely one for next year now I know! Don’t forget to feed back on your nibble!! Stunning and inspirational. I may give flower arranging a try sometime. Thank you Tina, why don’t you join in on a Monday? My flowers are never arranged, just plonked. But it is nice to bring a bit of the garden inside. 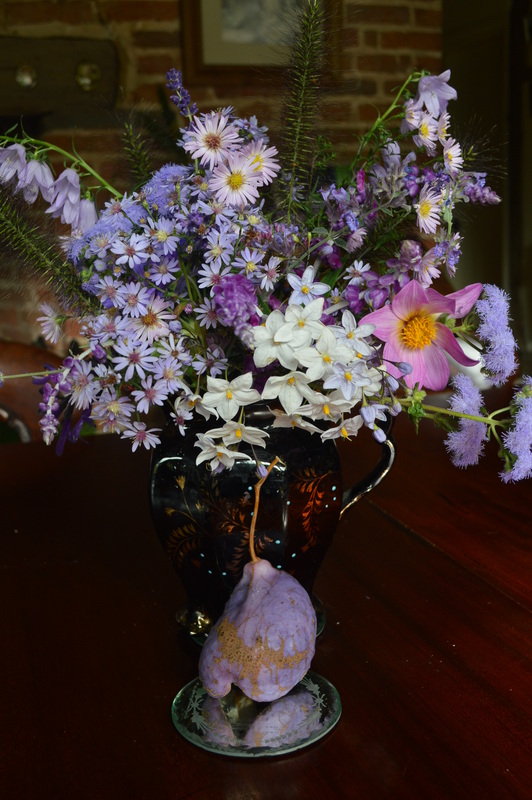 Wow this is amazing….I love asters and this is definitely a perfect vase to keep the season going….and what an amazing purple fruit. Fabulous display and arrangement. 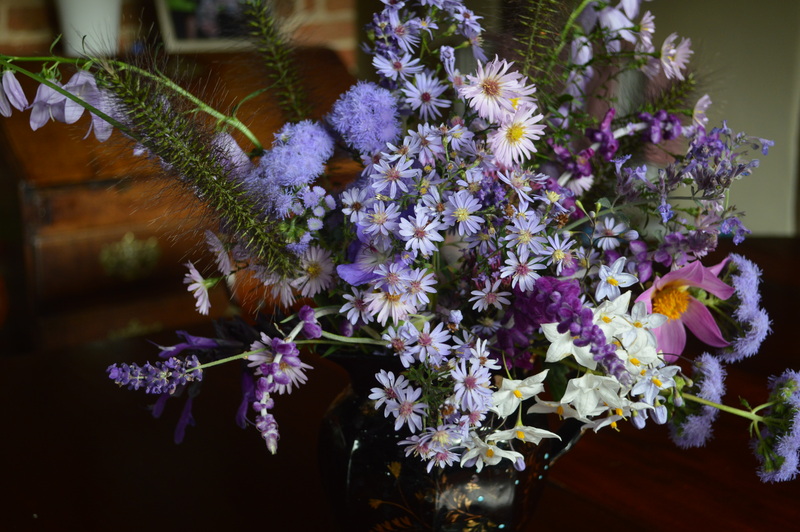 Thank you Donna, I love asters too, October would be dreary without them. You have a wonderful collection of purple blooms, not to speak of the fruit, which I find fascinating. How I’d love to walk through your garden! I wish you could walk through the garden with me too Kris, it would be such fun. I’d love to walk round yours too. Well I wouldn’t mind if we could go straight from summer to spring. But here there is so much winter in between. Such a brilliant color and the collection is outstanding! The fruit is fascinating, like mentioned above. Thank you. I am intrigued by the fruit, I have never had one before. And I have just found out it’s edible. Who’d have thought? Thank you Beth. I love the Novae-anglie asters, gorgeous colours and they don’t get mildew. So many surprises today! The solanum is new to me, as are the aster hybrids. 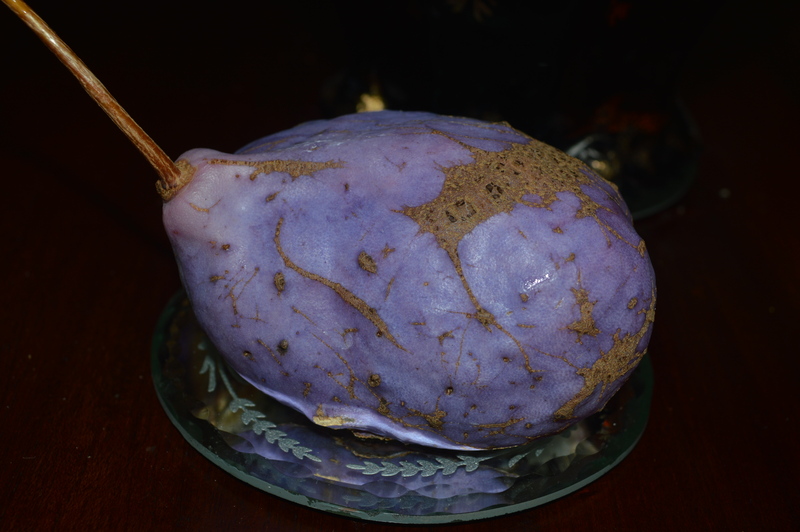 The akebia has such an unusual color of fruit, quite lovely, and adding the passionflower really set the bar – gorgeous! This solanum is so much prettier and delicate than the mauve or white ones you usually see. Passiflora ‘Silly Cow’ is gorgeous despite its awful name. It is covered in huge flowers. There are not many blue flowers to choose from. 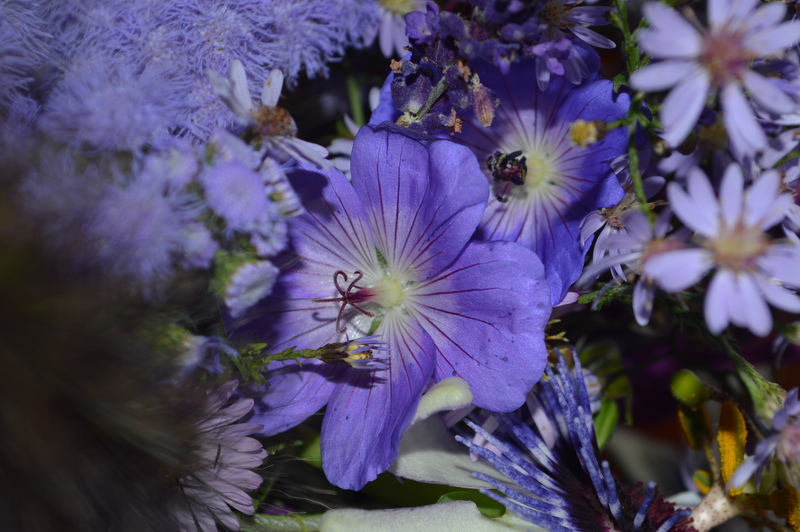 No, most flowers that are described as blue turn out to be purple or mauve. I love the true blues. 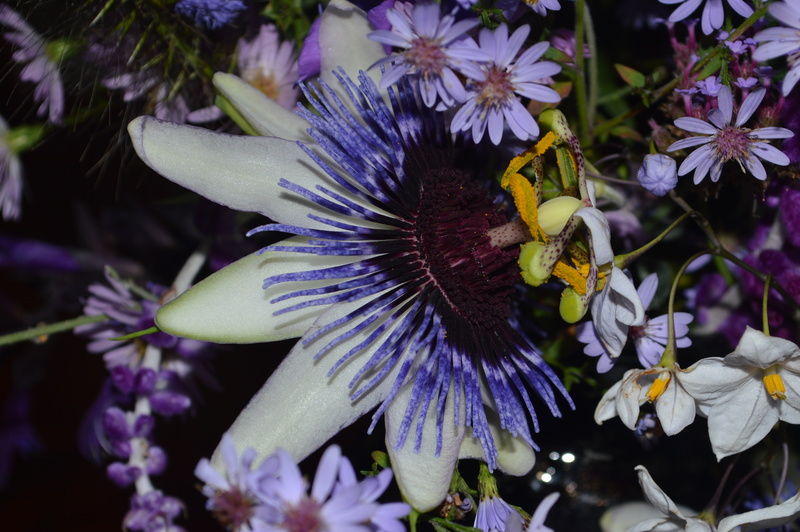 The Passion flower was found in Peru and the Spanish Jesuits named it after the Crucification. They found all sorts of symbolism there which I can never remember because it is all so silly and tedious and I resent how Christians took so many flowers and claimed them for their own didactic purposes. Thank you Dorris, the colours of October are quite summery, specially with lots of asters in sweetie shades. Fabulous! 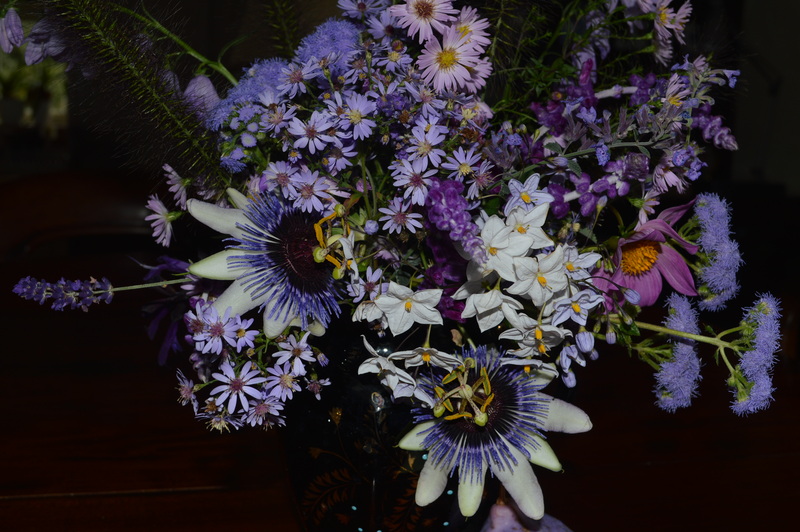 The asters are gorgeous and the whole arrangement looks even lovelier with the addition of the passion flowers. It certainly looks like summer is hanging on in your garden! October is a lovely month with lots of colour, unfortunately it all goes downhill in November. Lovely and airy, purple and blue are favorites of mine. Did the Passionflower last? Mine close at night. I use Ageratum too, as it grows wild here and I pull it! The Akebias would fruit where I am from and seedlings would come up under. I love the fruit. I would use the mourning vase for winter! No, you are right the Passion flower didn’t last. What a pity, I love the idea of a vase full of them. Have you ever tasted the Akebia fruit? I gather it is edible but I can’t bring myself to taste it. Gorgeous bouquet – relaxed, natural, celebratory! Thanks Mrs. D. I love these rich colours. Purple always looks good in a vase. Just lovely! The passion flower is amazing! Since I live way up njorth, I’ve only seen them in pictures. Passion Flower ‘Silly Cow’ has huge flowers. I didn’t realise that it isn’t hardy., What a shame. The colors and variation of flowers is enchanting. 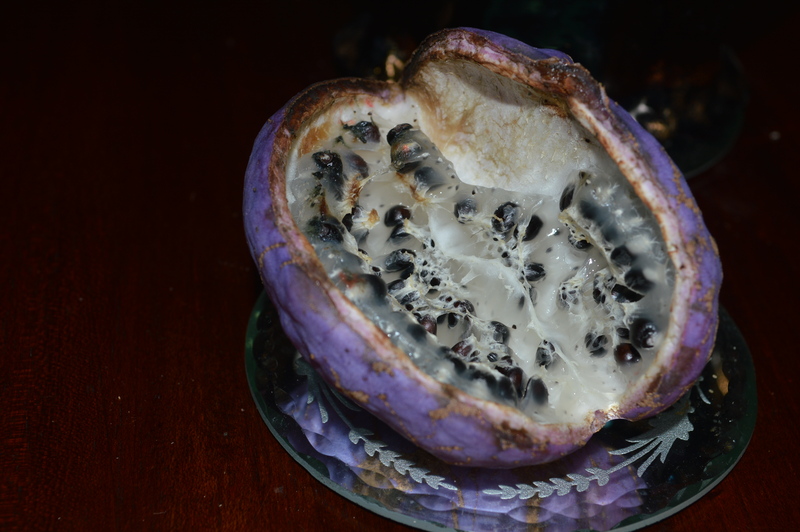 The Akebia quinata fruit is remarkable. It is plonked really, my arrangements always are. I love purple too, so rich. I do love the ageratum, such friendly flowers and as you say bloom for ages. Another lovely vase with some of my favourites in, love the salvias and the potato vine and of course the asters (I’m not playing either). Look forward to next time. Thank you Gill. 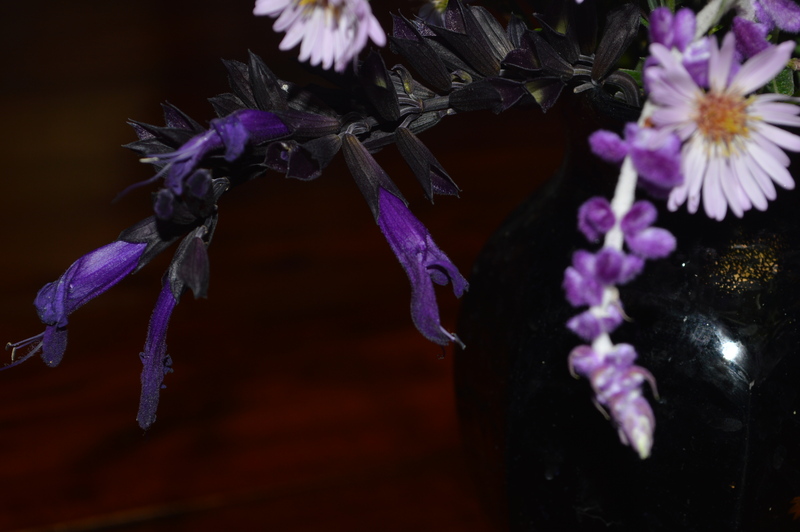 Do you have Salvia leucantha ‘Purple Velvet’? I could send you a cutting if you like. I would love one, I have Midnight, perhaps I could return the favour! So glad no snails were harmed in the creation of your arrangement. I love purple flowers, especially the lighter ones that have some blue in them. I love purple flowers too. We have the wrong sort of snails here otherwise I’d gladly grind the little beasts up to make dye. Thank you Marian. Yes, I think I’ve seen ‘Creche ar Pape’ at Great Dixter. I bought mine from Beth Chatto, she has it growing up the wall of the sales area. It looks wonderful.